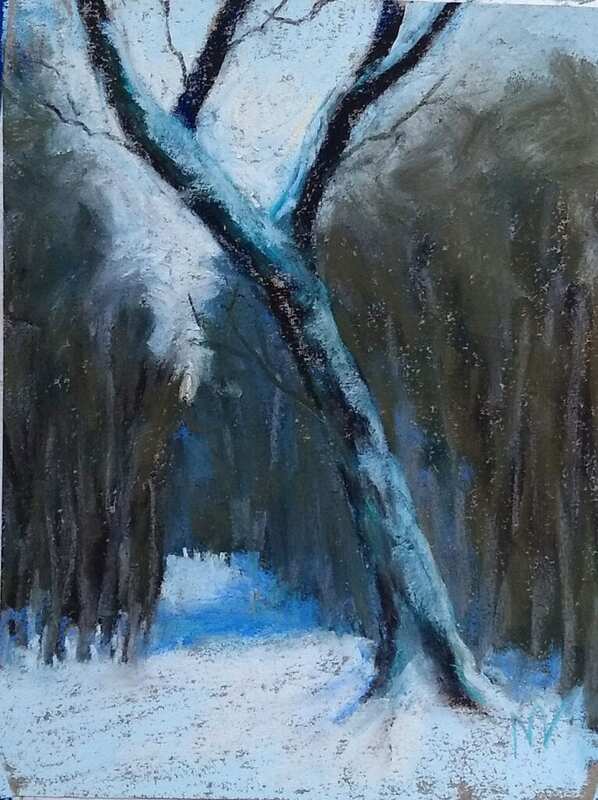 Leaning In, 6×8″ pastel of a tree leaning over the snow cover road in the woods by Marie Marfia ©2019. This painting available for a short time on eBay. Click the link to bid! Walking in the woods with the doggies and came across this big boy leaning over the road like he’s a boss or something. I take my life lessons where I can find them. 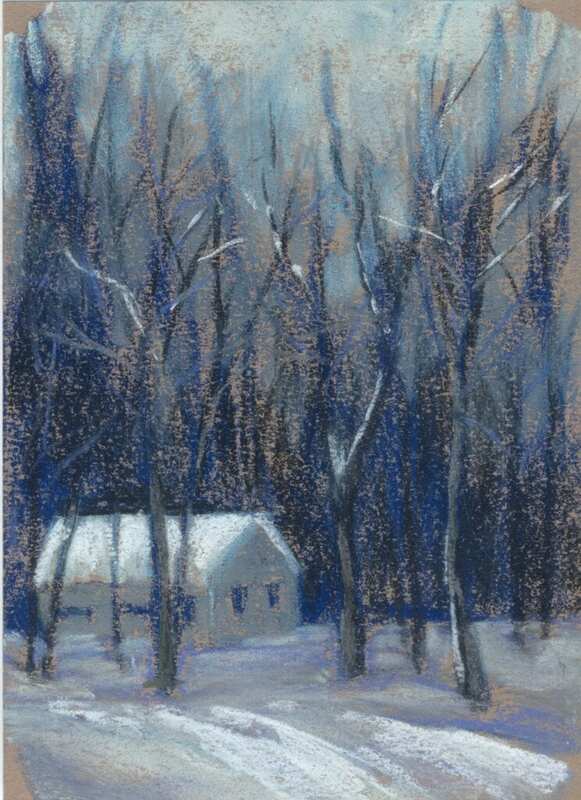 This entry was posted in A pastel a day, Daily painting, ebay sales, forest, inspiration, Landscape, painting a day, Pastels, path, Woods scape and tagged art for sale, forest, manistee national forest, painting, pastel, winter scene, woods on February 25, 2019 by Marie Marfia. 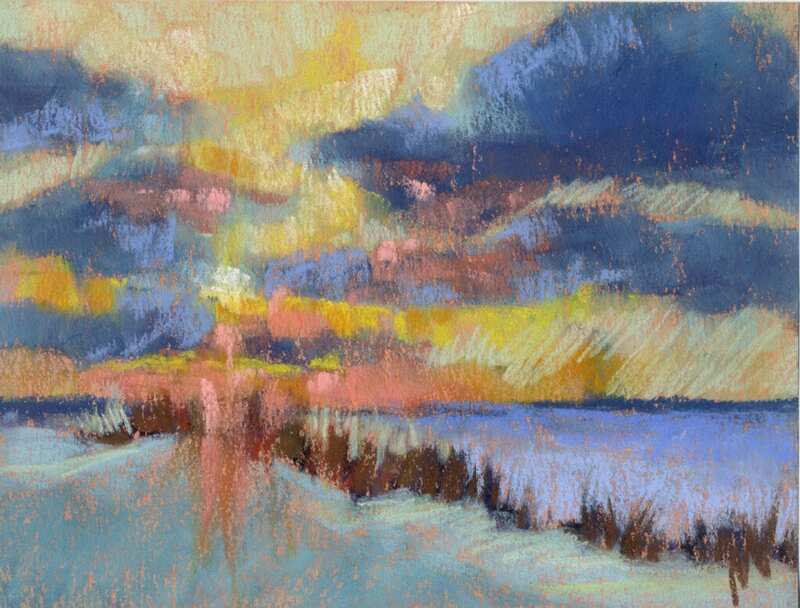 “Winter Dune Path,” 9×6″ pastel on paper by Marie Marfia ©2019. This painting is available on eBay for a short time. Click the link below for more info. This scene if from a recent walk along the dunes in wintertime. I love the Ludington State Park! 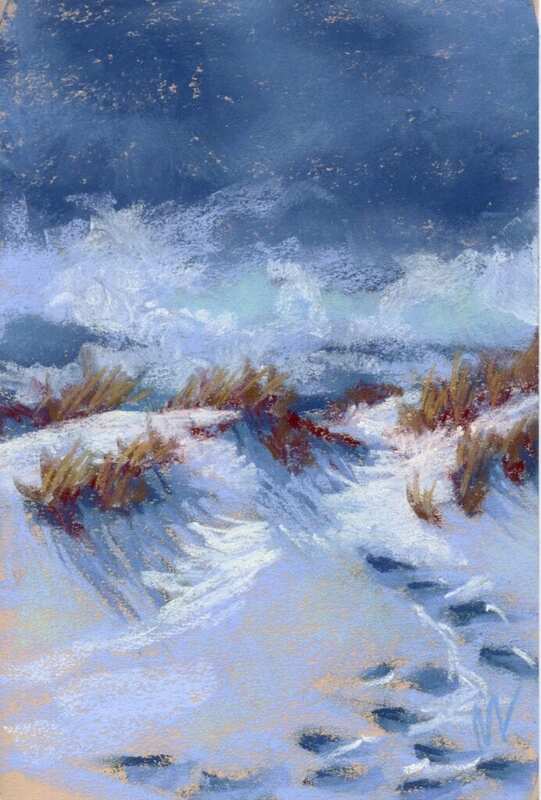 This entry was posted in A pastel a day, beach, ebay sales, Landscape, painting a day, Pastels, path, seascape and tagged art for sale, dune, dune grass, footprints, Lake Michigan, Ludington, painting, pastel, snow, state park, winter scene on February 20, 2019 by Marie Marfia. 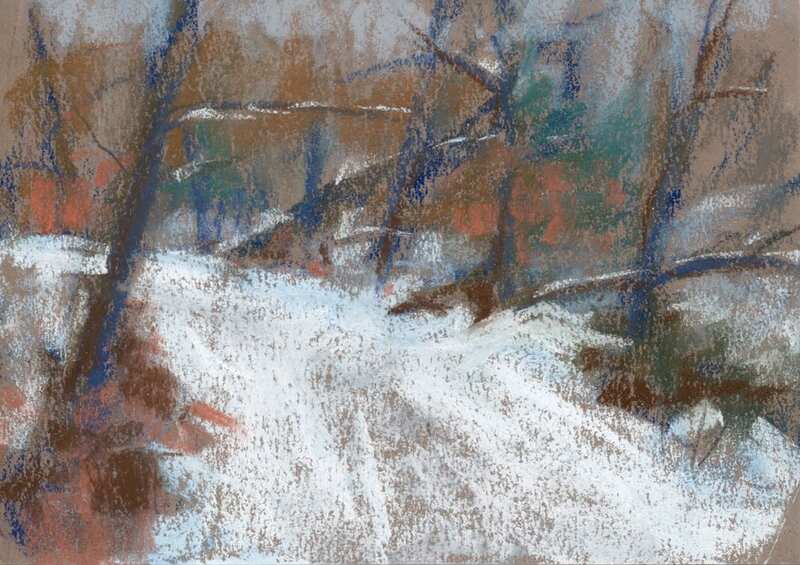 Snowy Trail, 5×7″ pastel painting of a snowy path through the woods by Marie Marfia. ©2019. This painting is based on a walk down a two-track road in the winter time. Sometimes when I stop to paint what seems like a monotone scene I am amazed by all the color that comes through. I love walking in the Manistee National Forest with my dogs. It inspires my work. 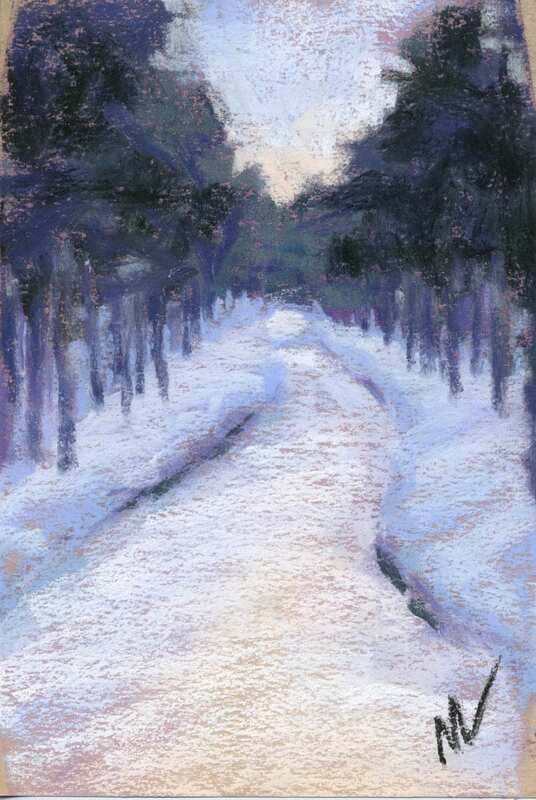 This entry was posted in A pastel a day, Daily painting, ebay sales, forest, Landscape, Manistee National Forest, painting a day, Pastels, Woods scape and tagged art for sale, forest, manistee national forest, Marie Marfia, painting, pastel, path, road, winter, winter scene, woods on February 3, 2019 by Marie Marfia.